Horizons has been manufacturing high quality, custom woven wood window blinds and shades for over 100 years. Their tradition of expert craftsmanship continues with Made In The USA woven wood window treatments that are as sturdy as they are attractive and affordable. All Horizons Natural Shades are crafted from renewable resources – such as bamboo, sustainable wood, grasses & reeds – through sustainable practices. 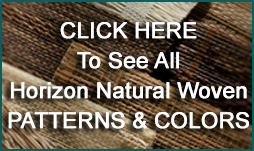 Horizons offers literally thousands of woven wood fabrics, materials, patterns, colors and styles to choose from. And we bring them to your home – so you can select your window treatments in the rooms where they will hang. This ensures that – no matter what your design style – you will find the perfect blinds and shades to suit your decor and your budget. The Classic Roman is our most popular style of window shade. This perpetually popular shade raises in soft folds. When lowered completely, the folds hang flat. The Hobbled Roman Shade is a new variation on the Classic Roman Shade. This window shade is constructed to always maintain its elegant Roman folds whether the shade is raised or lowered. Horizons’ versatile Averte Natural Fold window treatment functions on windows like a drapery. It can also be used on a wide patio door like a vertical blind – and can even serve as an elegant room divider. Because it is hand traversed, there aren’t any unsightly draw cords to tangle or break. Our unique patented Twin Shade gives you the best of both worlds! The Twin Shade is a fashionable Natural Woven Shade in the front, combined with a practical Roller Shade in the back that serves as a movable lining offering superior privacy and light filtering. Horizons Natural Woven Side Panels offer a sophisticated combination of today’s two most desirable window fashion trends: natural woven materials with adjustable side panels. Our Premium Woven Top Window Treatment Collection features stunning valances, that can be fashioned from any of the beautiful natural weaves in the Horizons Natural Woven Shade Collection.